Richard Pettibone helped set the stage for 80’s appropriation art by recycling the pop culture appropriations of Pop Art.His copies include work by Andy Warhol and Jasper Johns as well as Marcel Duchamp and Roy Lichtenstein. Richard Pettibone is one of the pioneers of appropriation art. The artist helped set the stage for 80’s appropriation art by recycling the pop culture appropriations of Pop Art. His earliest works were shadow-box assemblages addressing his interest in model making, especially toy trains and airplanes. 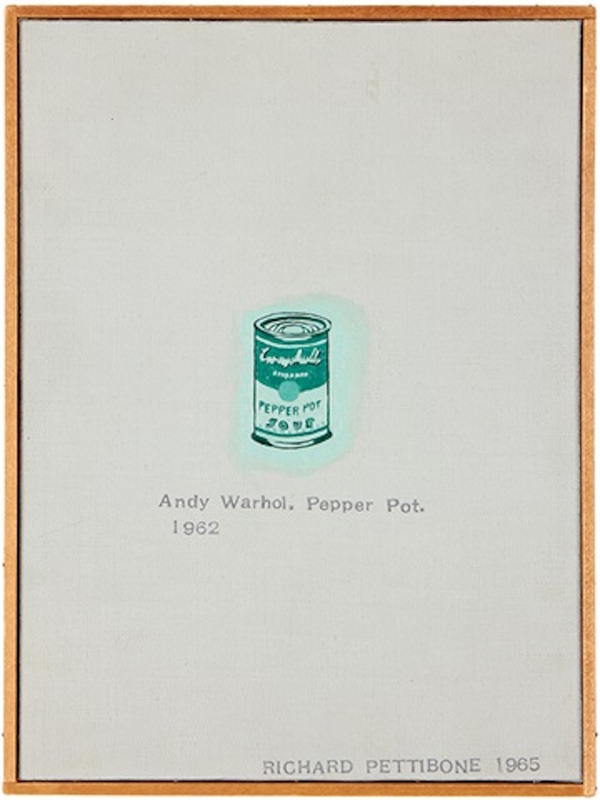 In 1964, when he was 26 and living in Los Angeles, he produced two tiny, exquisitely made copies of Andy Warhol’s 1962 painting “Campbell Soup Can (Pepper Pot),” one in green, the other in gray, both stamped with Warhol’s name and his own. He was making Pop Art and post-Pop Art. Marcel Duchamp, along with Andy Warhol were of significant influence. 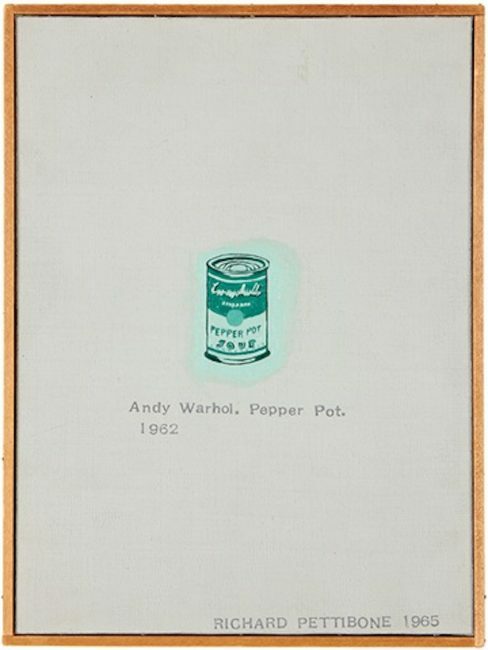 Pettibone encountered their ideas at full force in Warhol’s first gallery show (of the Campbell soup cans) at the Ferus Gallery in Los Angeles in 1962, and in Walter Hopp’s legendary Duchamp retrospective, at the Pasadena Art Museum in 1963, the first held in the United States. Between 2005-2006 the artist had a retrospective of approximately 200 paintings and sculptures at the Laguna Art Museum, Laguna Beach, California and The Frances Young Tang Teaching Museum and Art Gallery at Skidmore College, Saratoga Springs. Richard Pettibone does artwork that is described as “cloning”, which has resulted in “art that he can call his own.” His copies include work by Andy Warhol and Jasper Johns as well as Marcel Duchamp and Roy Lichtenstein. It is done under the umbrella of ‘Dada’ and “he has seemed completely unperturbed by this apparent lack of originality.” (Smith) In July, 2005, an exhibition of work by Pettibone was held at the Philadelphia Institute of Art, and included were 215 works representing four decades of his career.